Monday October 2nd 1899 I got through with the work in the morning with Wills help. I sewed some in the afternoon. Callie was up a little while. The boys hauled corn for Dave Simpson. Weather some pleasanter. Tuesday October 3rd 1899 It was a very pleasant day. The boys both hauled corn for Stevens. I was here alone all day. I took all my fruit down cellar. Cleaned the store room and the old shed kitchen. Will went to the Republican Convention as a delegate. 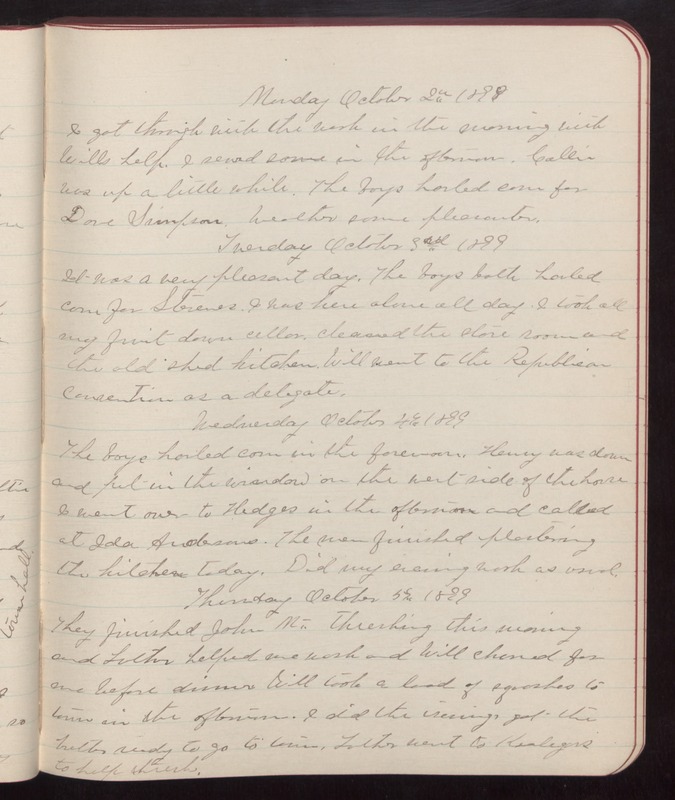 Wednesday October 4th 1899 The boys hauled corn in the forenoon. Henry was down and put in the window on the west side of the house I went over to Hedges in the afternoon and called at Ida Andersons. The men finished plastering the kitchen today. Did my evening work as usual. Thursday October 5th 1899 They finished John Mc. threshing this morning and Luther helped me wash and Will churned for me before dinner. Will took a load of squashes to town in the afternoon. I did the ironing, got the butter ready to go to town. Luther went to Kealegors to help thresh.